At a later date, she moved to Los Angeles, California on January, 2003. How should ABC Inc. now modify its customer table to reflect this change? This is the "Slowly Changing Dimension" problem. Slowly Changing Dimension Type 1: The new record replaces the original record. No trace of the old record exists. In Type 1 Slowly Changing Dimension, the new information simply overwrites the original information. In other words, no history is kept. 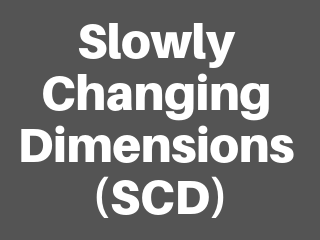 - This is the easiest way to handle the Slowly Changing Dimension problem, since there is no need to keep track of the old information. - All history is lost. By applying this methodology, it is not possible to trace back in history. For example, in this case, the company would not be able to know that Christina lived in Illinois before. About 50% of the time. Type 1 slowly changing dimension should be used when it is not necessary for the data warehouse to keep track of historical changes. Slowly Changing Dimension Type 2: A new record is added into the customer dimension table. Therefore, the customer is treated essentially as two people. In Type 2 Slowly Changing Dimension, a new record is added to the table to represent the new information. Therefore, both the original and the new record will be present. The newe record gets its own primary key. - This allows us to accurately keep all historical information. - This will cause the size of the table to grow fast. In cases where the number of rows for the table is very high to start with, storage and performance can become a concern. - This necessarily complicates the ETL process. Type 2 slowly changing dimension should be used when it is necessary for the data warehouse to track historical changes. Slowly Changing Dimension Type 3: The original record is modified to reflect the change.